What should the Red Wings do with Andreas Athanasiou? What’s coming next for Andreas Athanasiou? As the season is a couple days old, teams start to figure out where players belong in said system. Some teams have already looked very impressive like the New Jersey Devils, the Toronto Maple Leafs and surprisingly the Vegas Golden Knights. 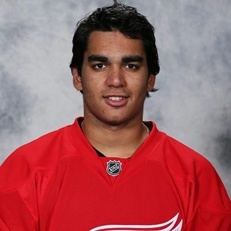 One team that has a decision to make is the Detroit Red Wings with young player, Andreas Athanasiou. Athanasiou is a 23-year-old winger for the Detroit Red Wings and showed for 29 points in 64 games last season, which extrapolates to a 37 point season had Athanasiou played a full year. While 37 points in 82 games doesn’t sound appealing, Athanasiou has already shown off his potential skill set of having fantastic hands and an immense skating ability. At 23, he’s still got a lot to learn and Detroit would love for him to return. However, this isn’t the case right now as Detroit is in a situation where they cannot agree on a contract term. Athanasiou has got offers as high as 2.5 million dollars to play for Avangard Omsk of the KHL and clearly, with some of Ken Holland’s terrible contracts throughout the years, this is something the Red Wings do not want to do. As Athanasiou is a Restricted Free Agent (RFA), he cannot just choose to sign with any team. In actuality, the Red Wings retain the rights to sign him until he becomes an Unrestricted Free Agent (UFA). Athanasiou still has the power to accept a certain contract, but he doesn’t have to option to sign with any other NHL team unless his rights are traded away. As of October 11th, 2017, it is seeming more and more likely that Athanasiou will be traded. The three destinations rumored to be interested are the Montreal Canadiens, the Ottawa Senators, and the Los Angeles Kings. As of me writing this, the Habs have only scored 4 goals in three games. Ovechkin scored the same amount alone against them in one game to put that into perspective. Clearly, the offense is in a struggle very early in the season and this has resulted in odd changes such as Galchenyuk being moved to the fourth line and Marc Bergevin already making it clear that they would like to trade the newly acquired defenseman, Mark Streit. Montreal finished 15th in Goals For last year and their offense heavily revolves around Max Pacioretty who scored 35 goals last season, slightly more than 15% of the goals scored by the Canadiens last season. Sure, they added Jonathan Drouin but he’s coming into a new system, was never really a proven NHL player and is playing Center, a position he’s rarely ever played in his life. If the Canadiens are serious about a playoff push this year with their core, I think a first step would be to add a winger and Athanasiou fits the role quite nicely as the Habs could use some goal scoring help and Athanasiou had 18 in a 64 game season. Athanasiou would be a very nice fit on one of the top two lines replacing either Arturri Lehkonen or Paul Byron on the wing and would provide some goal scoring depth. Going the other way would most likely be Alex Galchenyuk as he is not only young but could definitely use a change of scenery in Detroit. This trade makes a lot of sense for the Canadiens and should definitely be done if the pieces are right. The Ottawa Senators are another team that could desperately use a forward who can score more than 20 goals. The offense practically revolves around Erik Karlsson and while the Senators have actually played nice even strength hockey (despite what their record shows), they really could use some scoring help. Mike Hoffman is deemed as one of the greatest shooters in the NHL and on the Senators, he has yet to hit a 30 goal season. The Ottawa Senators also finished 22nd in Goals For last season with 212. Anyone who watches the Ottawa Senators knows that one of the biggest issues is their Power Play unit. Already, to start the 2017-2018 season, the Senators have gone 0-16 on the Power Play and finished with a mere 17% on the Power Play last year. This team has proven themselves to be a defensive threat in the NHL and a move to acquire Athanasiou is a perfect fit for this team. Guy Boucher practically switches his lines every game and runs all top three lines near equally in terms of ice time, so there is no real person or line Athanasiou would fit on, but definitely, would be moved to the 1st or 2nd Power Play immediately upon coming into the Sens organization. The Senators, however, lack the players to send in return as Cody Ceci would be the most likable return for the Red Wings. The Senators have made it very clear though that Ceci is not someone they would like to part with, leaving the top 3 prospects in the organization to be traded being Thomas Chabot, Logan Brown and Colin White who the Senators also do not want to part with. I believe if the Senators can manage to make a trade for Athanasiou while simultaneously keeping Ceci, Chabot, Brown, and White, Athanasiou makes a lot of sense for the Senators. The Los Angeles Kings just like the Ottawa Senators are a team who could desperately use a forward who has the potential to score more than 20 goals. The Kings are coming off a Murphy’s Law type year where every went wrong and only managed to get 199 goals for 24th in the NHL. Guys like Kopitar had terrible seasons, Quick was injured in the season opener and was out until March and the trade for Ben Bishop at the trade deadline never really worked and the Kings ended up missing the postseason. Anze Kopitar is playing with Alex Iafallo and Dustin Brown this year and could definitely benefit from having the speed and skill that Athanasiou brings to the table. The Kings like the Senators as well, also don’t have that struggling piece that could use a new change of scenery. Most likely if the Kings were to pull the trigger, a young piece of the now or the future would be the centerpiece such as Derek Forbort, Adrian Kempe, Kale Clague or Gabriel Vilardi, however, it’s hard to believe the Kings would get rid of their two best prospects and two players who are having an immediate impact at the NHL level. Also like the Senators, I believe if they can keep these 4 prospects and acquire Athanasiou, it’s a win for the Kings. The Canadiens are ultimately the best fit in my eyes for Athanasiou. Their lack of scoring outside of Pacioretty, their system which revolves heavily around Carey Price, and the need to find Galchenyuk a role are the main reasons why I think Athanasiou in Montreal would be a fantastic fit.